How premature was Daniel Martin? My grandfather, Joel Daniel MARTIN, was born 28 Aug 1886 in Richland County, South Carolina. Daniel, as he was called, was the first born child of Adolphus Burdine MARTIN and Lizzie LEE MARTIN. This family owned property of what is now Fort Jackson. I heard many times in my life about Daniel being small when he was born. It was said that when he was born he was small enough that he could to fit into the coffee pot. So how small would that be? I did some research. Coffee pots of that era were between 8 and 12 inches; most were 9 or 10 inches. Clearly Daniel could have been 10 inches long with his legs extended. That would be a baby born 20-22 weeks from the research I did. He wouldn’t have survived if born that early. I’m thinking ‘fitting into the coffee pot’ means with his legs pulled up like newborns do until they’re several days old. A baby born at 32 weeks would be about 16 ½ inches long and about 3.75 lbs. At 34 weeks, a baby is about 17 ¾ inches long and about 4.75 lbs. Based on that, I think Daniel was probably about 8 weeks early. Could he have survived being born that early? Certainly. I worked in a neonatal unit when I was a respiratory therapist, and we had several babies that were that early who got along fine without supplemental oxygen or breathing support. Look at the photo below. Daniel was not a tall man even though his father and his father’s siblings were tall. 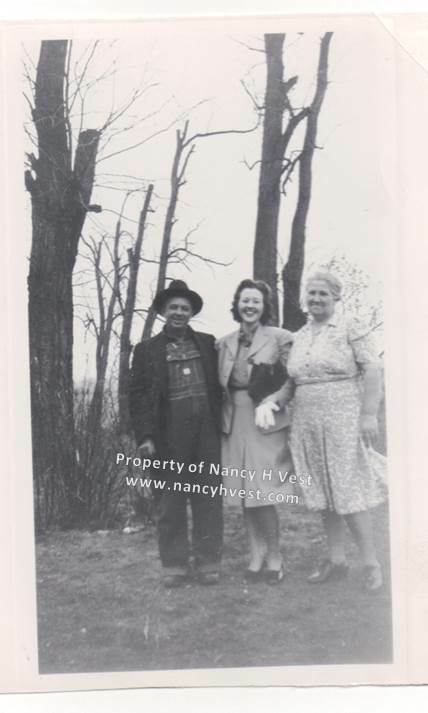 In the photo below, Daniel is with his daughter, Gladys, and his wife, Florrie nee THOMAS. Gladys was only 5’4”. I know this because she was my mother. You can see that Daniel wasn’t very tall with this point of reference. Daniel’s mother was short, so perhaps he just took after her. Or was his short stature a result of his premature birth?